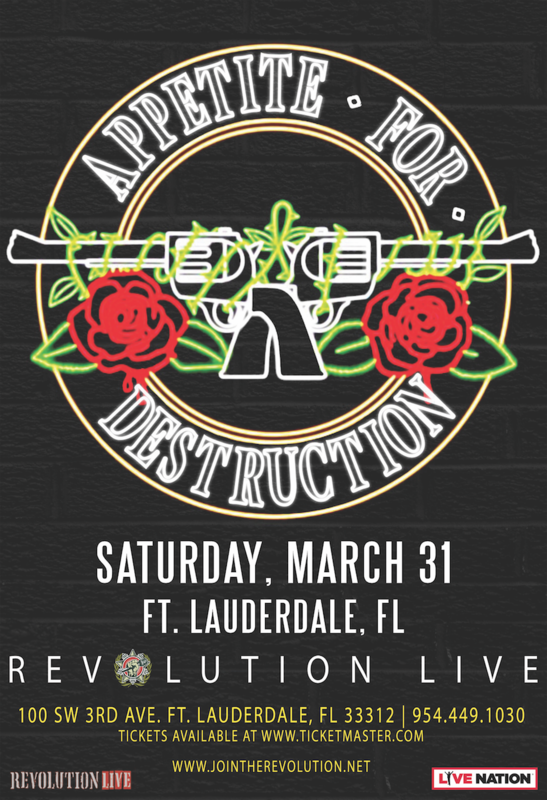 Appetite for Destruction, the ultimate Guns N’ Roses experience, have been performing the music of Guns N’ Roses for almost twenty years, selling out venues throughout the Northeast. They have performed with special guest and current G N’ R keyboardist Dizzy Reed and shared two bills with ex-G N’ R guitarist Gilby Clarke. Appetite delivers the definitive Guns N’ Roses show, performing all the hit singles, rock radio staples, and fan favorites with acute attention to detail, serving as both outstanding lookalikes and soundalikes for the legendary band. Their catalog of songs is unsurpassed, as is their nearly two-decade-long career of bringing G N’ R to the masses. You may not get to see the entire classic Guns N’ Roses lineup live, but you can surely satisfy your appetite with Appetite for Destruction.